PSTA is excited to host a series of three Telephone Town Halls to discuss the Greenlight Pinellas Plan. Residents from all over Pinellas County will receive automated calls inviting them to participate, to listen and make their voices heard. Listeners will have the chance to ask questions *live* during the town hall meeting, with instructions given during the call. In addition, listeners can also share questions and comments via our social media channels. Make sure your voice is heard! Thursday, July 24 at 10:00 a.m.
Tuesday, July 29 at 7:15 p.m.
Thursday, July 31 at 7:15 p.m. The biggest celebration of its kind in the state of Florida just got bigger. 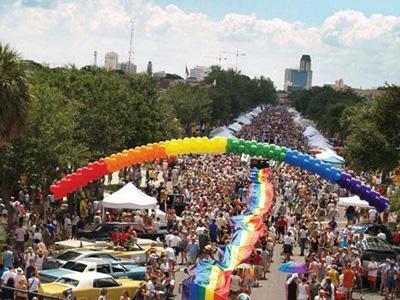 The St. Pete Pride Street Festival and Promenade will now make up a full weekend of celebration. Whether you’re going to the parade on Saturday or the Street Festival on Sunday, you don’t have to fight traffic or struggle to find a parking spot if you let PSTA be your ride to Pride. PSTA buses will be running frequently along 1st Avenues north and south – parallel to the events – making it easy to leave your car at home or in an outlying parking spot while PSTA chauffeurs you to and from the celebrations. PSTA operates several routes along the parade and festival corridor, which will give revelers easy and frequent access to cool, comfortable buses throughout the day and well into the evening. Among the routes serving the celebration in the Grand Central District will be the Central Avenue Trolley, Routes 7, 18, 20 and 52. Several routes will also be detoured to accommodate the celebrations and those detours can be found at the PSTA Rider Alert webpage. St. Pete Pride, which is in its 12th year, dwarfs similar gatherings in Miami, Fort Lauderdale and Orlando, and draws thousands of visitors to the area’s bars, restaurants and accommodations for the festivities. For all-things PSTA, including trip planning, schedules maps and fares visit the agency’s award-winning website www.psta.net. You can also keep up with the agency’s plans for the future of transportation in Pinellas County and participate in the community conversation helping to shape those plans at www.greenlightpinellas.org. Did you know that transportation is now the biggest household expense in the United States behind rent and mortgage? If you’re surprised to learn that fact, you’re not alone, but it’s not hard to understand when you consider that USA Today and the American Automobile Association say the average cost to own a car is now more than $9,000 a year. Additionally, the news outlets started their week with reports about gasoline prices are once again on the rise. That means that a fill-up for many cars now costs more than a full-fare, unlimited ride monthly bus pass on PSTA ($65). These are just some of the reasons why PSTA leaders are joining APTA and transit agencies nationwide to promote the ninth annual National Dump the Pump Day on Thursday, June 19. “The 2014 National Dump the Pump Day is a day that encourages people to ride public transportation and save money, instead of driving a car,” says Virginia Miller APTA Director of Media Relations. “In fact, according to the April APTA Transit Savings Report, a two-person household can save an average of more than $10,000 annually by downsizing to one car.” In addition to saving money, officials say public transit use cuts pollution, demand for foreign oil and stress as you let someone else drive while you relax, read or surf the internet during your commute. To participate and “Dump the Pump” all you have to do to is to leave the car at home this Thursday and ride PSTA. For those who have never ridden before, you can call the PSTA InfoLine at (727) 540-1900 to learn how or book a special “Show Me” service offered by the agency. “We established the ‘Show Me’ program to make it easier for people to take their first trip on PSTA,” says agency spokesperson Bob Lasher. “We found that the main reason why people don’t try PSTA is the uneasiness about doing something new for the first time, so we created this program to ease their mind.” When a “Show Me” is booked, a PSTA employee meets with an individual or group and teaches them how to plan a trip – either electronically or using printed materials – then the employee takes them on a free round-trip ride to practice and see just how easy it is to use PSTA. The agency has plenty of other how-to-ride resources as well including a Google Trip planner located on the home page of www.psta.net. You can also view various “how-to” videos on the site’s “How to Ride” page, www.psta.net/howtoride.php. Full fare is $2.00 one way or $4.50 all day $1.00 & $2.25 for seniors and people with disabilities. Daily passes can be purchased right on the bus, although exact change is required. When you’re ready to travel, you can then call, text, logon or use a smartphone to find out when your bus will arrive at your stop with PSTA’s new Real Time Bus Information System. Public transportation is a $57 billion industry, which employs more than 400,000 people. Every $10 million in operating investments yields $32 million in increased business sales. From 2006-2011, residential property values performed 42 percent better on average if they were located near public transportation with high-frequency service. Public transportation use in the US saves 4.2 billion gallons of gasoline annually. To learn more about PSTA, please visit the agency’s award winning website at www.psta.net and to learn more about the future of transit in Pinellas County, learn about the Greenlight Pinellas Plan at www.greennlightpinellas.com. Pinellas County’s new plan to significantly improve public transit picked up another critical endorsement this evening. Leaders from the city of Dunedin voted unanimously to endorse the transformational, county-wide transit proposal known as the Greenlight Pinellas Plan. “One thing I’m excited about is that this is a comprehensive transportation plan, not just one mode or one area. We’re putting the right kind of transportation in the right communities throughout the county,” said Dunedin Commissioner and PSTA Board Member Julie Ward-Bujalski. “It can’t be understated as to what the increased frequencies and later service hours will mean to our community,” added Mayor Dave Eggers after hearing details about the bus service improvements in the plan. At the heart of the proposal is a ballot measure set for the November 4, 2014 election asking voters to approve a funding change for the county’s transit system – PSTA – from its current .7305 mil property tax to a 1% sales tax (not applied to groceries, medical items and limited to the first $5,000 of any purchase). That change would allow for significant improvements to the county’s transit service, and vastly increase transportation options throughout the county. 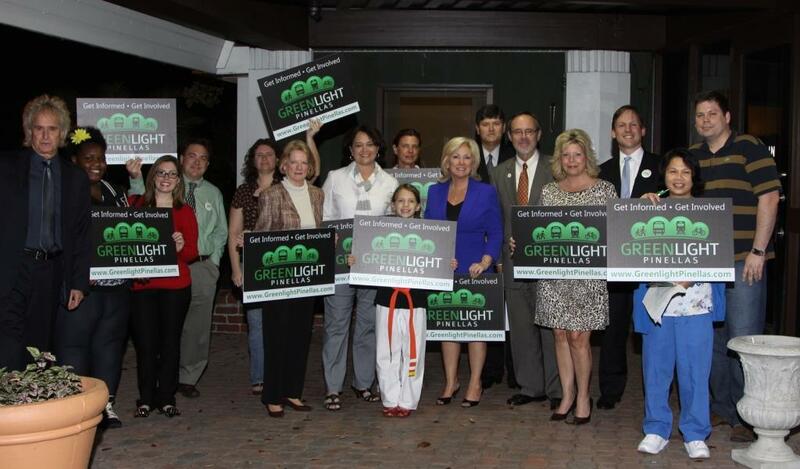 Details, Q&A and background data can be found at www.greenlightpinellas.com. Buses running more frequently and for longer hours of the day – especially on weekends. Service to Tampa at night and on weekends including TIA and Westshore. Circulators connecting neighborhoods to the primary transit corridors. Those enhancements will then form a foundation of quick, easy connections for a future passenger rail line from St. Petersburg to the Gateway/Carillon area and to Clearwater. The recession has reduced PSTA’s property tax revenue by more than $40 million dollars since 2008, however, service cuts and streamlining and record-setting demand have led to a 23% increase in bus ridership over the same period. To help prevent further cuts in service, the agency is using reserve funds to accommodate the record ridership. If the Greenlight measure doesn’t pass, those reserves will be depleted by 2017, forcing a 28% cut in bus service. 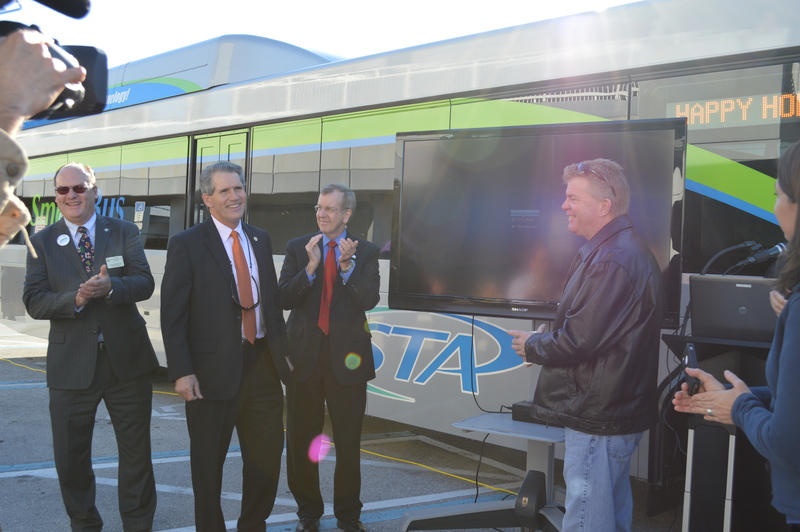 PSTA Leaders and Local Officials Celebrate New Hybrid Buses and On-Board Wi-Fi Pilot Program! With the addition of the eight new hybrids, PSTA now has 40 of the fuel efficient buses out of a fleet total of 188 full sized vehicles. Additionally, eight more hybrids are on order and scheduled for delivery in late 2014. The diesel-electric vehicles average a 56% increase in fuel economy over standard diesel models and the new buses will be replacing older non-hybrid vehicles that have reached the end of their 12-year life span. If you’d like to take advantage of Pinellas County’s increasingly popular transit system and ride one of the new hybrid buses, just visit the agency’s award-winning website at: www.PSTA.net. Patrons are also encouraged to use PSTA’s new Real Time Bus Information system to find out exactly when the next bus will arrive at their stop. Simply visit to www.RidePSTA.net or call the PSTA InfoLine at (727) 540-1900.